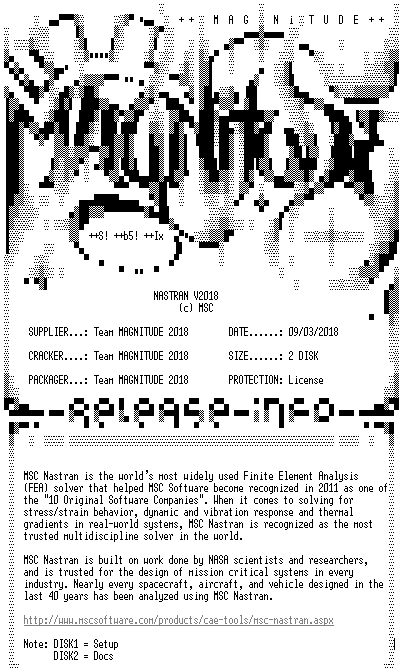 MSC Nastran 2018 + Documentation - 行业软件 - CG牛网,牛CG,顶尖资源 - Powered by Discuz! MSC Software is pleased to announce the release of MSC Nastran 2018. Designed to increase efficiency and user productivity, this major release introduces new material properties, large assembly modeling techniques, enhanced contact analysis as well as more efficient solver methods. - Advanced composite materials such as laminated metals or SFRP laminates (short fiber reinforce plastics) have commonly been used for noise reduction studies among both auto and aero industries. These materials require development of structural damping coefficients that vary over a certain frequency range. Using MSC Nastran 2018, engineers can now implement frequency dependent material properties for their dynamic simulations. - Modern materials such as carbon fibers can be molded into complex structural shapes. Implementing these laminated materials in simulations often requires users to change the thickness or orientation of certain plies. Users can now take advantage of spatially varying properties for composite plies and/or other properties. - Managing complex multi-level assemblies can be time consuming and challenging for many applications. The newly introduced "Modules" in MSC Nastran is a convenient method to combine complex assemblies into a full assembly without the need to use superelements or additional modeling techniques. - The Multiple Mass Configuration feature in MSC Nastran is a convenient method to account for multiple mass cases that correspond to structural mass, payloads, fuel and other environmental conditions in design of aerospace or other vehicles. - For complex models that consist of various parts and components, contact establishment can be very time consuming. The new Automatic Contact Generation feature allows users to efficiently create contact bodies and define the contact relationship between these automatically-defined contact bodies. - High Performance Computing methods are enhanced to deliver a faster turnaround for large simulation models. For example, the new MPYAD method in MSC Nastran 2018 can result in 2x gain in solver performance for many models. - SOL 700 can now execute the new Dytran-based Lagrangian solver, which allows users to take advantage of new materials and other enhancements. Other enhancements include grid point force balance output, topology and topometry optimization enhancements, rotordynamics enhancements, and external superelements in SOL 400. About MSC Nastran. MSC Nastran is the world's most widely used Finite Element Analysis (FEA) solver. When it comes to simulating stress, dynamics, or vibration of real-world, complex systems, MSC Nastran is still the best and most trusted software in the world – period. Today, manufacturers of everything from parts to complex assemblies are choosing the FEA solver that is reliable and accurate enough to be certified by the FAA and other regulatory agencies. Engineers and analysts tasked with virtual prototyping are challenged to produce results fast enough to impact design decisions, and accurate enough to give their companies and management the confidence to replace physical prototypes. In today's world, nobody has time or budget to spend evaluating the accuracy of their FEA software – you need to know it's right. MSC Nastran is built on work done by NASA scientists and researchers, and is trusted to design mission critical systems in every industry. Nearly every spacecraft, aircraft, and vehicle designed in the last 40 years has been analyzed using MSC Nastran. In recent years, we've applied some of the best and brightest scientists in CAE to extend MSC Nastran's power and efficiency, resulting in its continued status as the world's best, most trusted, and most widely used FEA software – period. New modular packaging that enable you to get only what you need makes it more affordable to own Nastran than ever. About MSC Software Corporation. 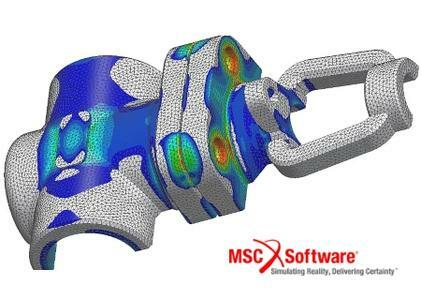 MSC Software is one of the ten original software companies and a global leader in helping product manufacturers to advance their engineering methods with simulation software and services. As a trusted partner, MSC Software helps companies improve quality, save time, and reduce costs associated with design and test of manufactured products. MSC Software is based in Newport Beach, California and employs 1,200 professionals in 22 countries. Having established its subsidiary in Tokyo, Japan in February 1982, it now has its offices in Osaka and Nagoya.
? 1. Unpack, burn or mount. ?
? 2. Read .txt from /MAGNiTUDE dir on the disk first. ?